Line an 9-inch square pan with parchment paper allowing the parchment to run up the sides of the pan. Butter any exposed bottom and sides of the pan so the caramel will release from the pan. Heat the sugar, heavy cream, honey, butter, and salt in a large pot on medium heat and stirring until sugar is dissolved. Continue to cook and stir over medium-high until the mixture reaches about 248 degrees. Remove pot from heat, add vanilla and stir. Pour the caramel into prepared pan. Let cool until firm, about two hours. When firm lift caramel from pan by lifting with parchment, then set on cutting board. The parchment will help keep the caramel from sticking to the cutting board. Oil a knife and cut caramels and twist individual caramels in cello or caramel wrappers. Line an 8-inch square pan with parchment paper allowing the parchment to run up the sides of the pan. Butter any exposed bottom and sides of the pan so the caramel will release from the pan. Boil the apple cider in a 4-quart saucepan over high heat stirring occasionally until cider is reduced to approximately 3/4 cup. Attach a candy thermometer to the side of the pan then add butter, granulated sugar, dark-brown sugar, heavy cream, cinnamon, and sea salt to cider and place over medium-high heat. Cook over medium-high until mixture reaches 244 F, remove from heat, stir in bacon bits, and pour into the prepared pan. Let cool until firm, about two hours. When firm lift caramel from pan by lifting with parchment, then set on cutting board. The parchment will help keep the caramel from sticking to the cutting board. Oil a knife and cut caramels and twist individual caramels in cello or caramel wrappers. Attach a candy thermometer to the side of the pan then add butter, granulated sugar, light-brown sugar, heavy cream, cinnamon, and sea salt to cider and place over medium-high heat. Cook over medium-high until mixture reaches 244 F, remove from heat and pour into the prepared pan. Butter a 9"x9" pan and set aside. Place sugar, butter, corn syrup, and 1 cup whipping cream in a 3-quart pan and bring to a roll boil over medium high heat while stirring constantly. Slowly stir in the second cup of whipping cream, stirring constantly, so that the boiling does not stop. when all of the cream is added, place a candy thermometer in the pan. As the temperature increases, reduce the heat. Cook to 246 F. for a firm caramel, 244 F. for a softer caramel. Pour the caramel into the prepared pan. When firm, cut with a lightly buttered knife or pizza cutter. Wrap pieces in caramel paper or dip in chocolate. Line an 9x13-inch pan with parchment paper allowing the parchment to run up the sides of the pan. Butter any exposed bottom and sides of the pan so the caramel will release from the pan. Boil India Pale Ale in a 4-quart saucepan over high heat stirring occasionally until ale is reduced to approximately 3/4 cup. Remove ale reduction from heat. Attach a candy thermometer to the side of the pan then add light-brown sugar, butter, corn syrup, and sweetened condensed milk and place over medium-high heat. Cook over medium-high until mixture reaches 244 F. Add beer reduction to caramel and cook back up to 244 F. Remove caramel from heat and pour into the prepared pan and sprinkle fine sea salt on the surface. Melt butter in 3-quart pan, add brown sugar, salt, stirring until combined. Blend in corn syrup, gradually add sweetened condensed milk, stirring constantly. Cook and stir over medium heat to 246 F. for a firm caramel, 244 F. for a softer caramel. Remove from heat, stir in vanilla, pour into buttered 8 x 11 pan. 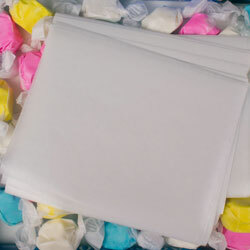 Cool, then cut into squares and wrap in waxed paper. Experiment with different sea salts, each one will add its own distinct flavor character. Mix all ingredients, except vanilla, in a heavy saucepan. Boil, stirring constantly, until thermometer registers 246 F. Add vanilla and pour into the buttered pan. When cool, cut into small squares with a buttered knife or pizza cutter and wrap in waxed caramel/taffy wrap. Mix sugar and cornstarch. Combine sugar mixture corn syrup, water, butter and salt. Cook over medium heat stirring constantly until sugar is dissolved. Continue cooking without stirring until candy thermometer reaches 260-270 F. (Mixture will form a firm but flexible ball when drizzled in cold water.) Remove from heat and after boiling has stopped. Stir in flavoring and coloring. Pour onto lightly greased pan and let rest until mixture is cool enough to handle. Pull the taffy with buttered hands. Cut into approximately 1-inch pieces. 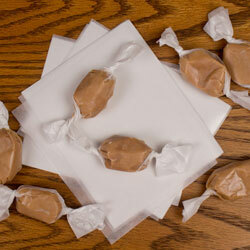 Wrap the candy pieces in caramel/taffy paper.